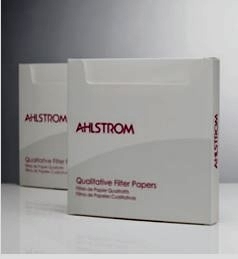 Ahlstrom manufactures a series of extremely high purity acid washed filter papers designed for use in analytical and gravimetric analysis. The quantitative grades are manufactured from top quality cotton linters using ultra-pure reverse-osmosis water and are further treated with dilute acid to remove any remaining organic and inorganic impurities. All quantitative grades are manufactured in a strictly controlled environment that ensures high uniformity and high purity from filter to filter.